I’ve been reading a lot lately but haven’t reviewed all the books because for some of them I didn’t have enough to say for a full post. Here are 10 books that I keep meaning to write mini-reviews about. This is part of Lindsey Davis’ series about a female private investigator in ancient Rome. I love her books. In this one Flavia is helping her friend and potential love interest dig up dirt on political candidates. At the same time she is dealing with a problem at her family’s auction business. A large chest that was consigned turned out to contain a body. I enjoyed the book but it wasn’t my favorite of the series. Definitely will keep reading them though. Good girl high school student has a strange encounter with a man at a party hosted by a friend’s family to help students make contacts with adults who set up internships. Later she is drugged and wakes up in the hospital not remembering what happened. In the meantime a deadly virus is sweeping the country and Washington D.C. is locked down. She travels between her prep school and her uncle’s house in a poor part of town trying to figure out why people seem to be targeting her family. I’ve been raving about this author’s The Summer Prince all year. This one didn’t thrill me as much. It wasn’t bad. It just wasn’t up to the other book. Felicia Day was a home schooled violin prodigy and a math major in college so of course she decided to become an actress. With parts few and far between she decided to write her own web series and that spawned an Internet empire. I know her mostly from her traditional acting jobs on sci-fi/fantasy shows like Buffy, Eureka, and Supernatural. I haven’t seen in web stuff. She glosses over the TV roles or mentions them in passing. I would have liked to hear more about that. The story of making her own path is interesting though. This is a magical realism book about a family who own a knitting shop where they knit blessings into garments for people. Now the shop is due to be torn down due to gentrification of their neighborhood immediately after the family matriarch dies. The next generation of sisters are trying to figure out how to manage their family legacy. Loved the concept. Didn’t really like the story that much. Characters were too wishy washy for my liking. Every year two children was taken from the village. One goes to the School for Good and one goes to the School for Evil. Sophie was born to go to the School for Good. She’s blond and pretty and nice enough to lower her standards and befriend the outcast Agatha. When Sophie and Agatha are taken, they are horrified to find that Sophie is assigned to Evil and Agatha is Good. Again, I loved the idea but the story didn’t live up to the idea for me. Dora Rare lives in an isolated village in early 20th century Nova Scotia. She is learning from the local midwife. When a doctor comes to the town and tries to persuade the women to pay to go to a hospital for child birth, the town needs to decide if modern medicine is always better. For someone who hates babies, I really like books about midwives. This is a great look at both medical history and women’s history in rural areas. This is the second book of a series. Josetta is a Princess but no longer close in line to the throne. She is now working in the poor section of the city helping people despite what her family thinks. She meets a con man who might be more than he seems. I like this series. I’m looking forward to reading the next one but I don’t want to finish the series too quickly. A child is found abandoned on a dock in Australia. How did she get to Australia on a boat from England by herself. Why isn’t anyone looking for her? Years later her granddaughter takes up the search for the answer to the mystery. I read this for the Travel the World in Books readathon. It was supposed to be an Australian book but ended up being mostly in England telling the story that lead to the child getting on the boat. I think I had read this before but forgot it — which is ironic. This is a guidebook to geek culture. I’m pretty steeped in it so I didn’t learn much but I did enjoy skimming through this. Hey, now THIS is a Top Ten Tuesday I should have participated in! I’ve been sick so I;ve gotten way behind on my reviews – hoping to catch up a bit this week. Looks like quite a variety of books here. I noticed that many of these you thought were OK but didn’t love – maybe that’s why you haven’t reviewed them yet. I find it’s tougher to get motivated to write full reviews of books you felt ambivalent about. If I didn’t like a book at all (rare but it happens! ), I don’t bother with the reviews – I decided long ago to focus my blog on book I want to recommend. Great post! You’ve inspired me to get moving on my backlog. Came here through the Lit Lovers link-up again. I can’t wait to write about books I’ve loved or ones that made me angry. The just ok ones are hard to get motivated for. I am intrigued by the Lindsey Davis series! A female PI in Rome sounds very cool — which of the series did you like the most? I liked the first book most. There is also a whole series that takes before this about her adoptive father. He starts the investigation business. 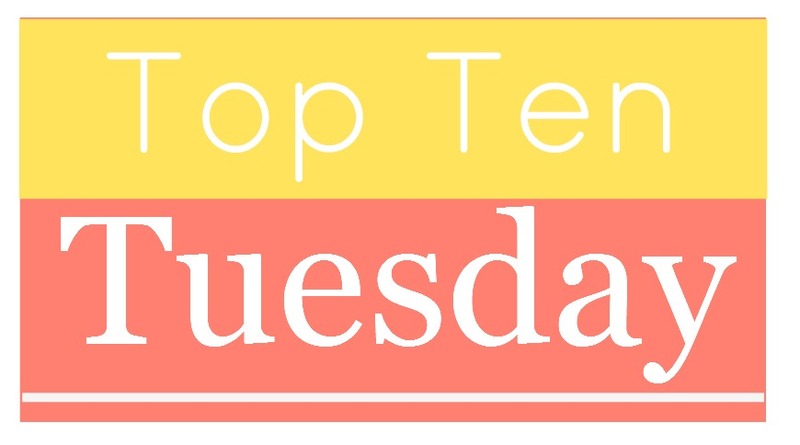 Nice list of books and theme for this week’s TTT post!! Great topic 😀 I’ve been hearing lots of buzz about The School for Good and Evil – I’m sorry you didn’t enjoy it as much as you hoped. Am I right in thinking it’s a trilogy/series? Will you read the other books? I’ve also been meaning to read some of Kate Morton’s books!